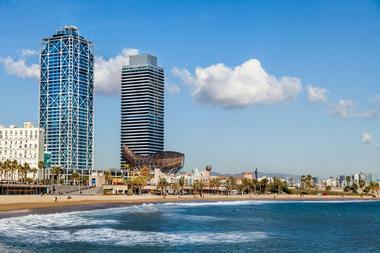 Barcelona has a mild and pleasant Mediterranean climate. Even in winter there are many sunny days - it can be chilly to cold but it rarely snows in Barcelona. Best time to visit Barcelona is in early spring and in the fall. During the months of May to June the weather is pleasant and there are many festivals in the city. Many people visit Barcelona during the summer because this is when schools are on breaks. Summer time is hot and humid and crowded. Locals go elsewhere to find some relief and return in the fall when temperatures drop back down into the comfort zone. In January, the coldest month in Barcelona, the average high temperature and the average low temperature range between 57°F (14°C) and 41°F (5°C). The cooler temperature coincides with some of the best deals of the year for travel and accommodations. Barcelona Weather in February: High temperature averages hold steady at 57°F (14°C) for February. Meanwhile, the low temperature average increases by a couple of degrees to 43°F (6°C). March sees the temperature averages increase by a few degrees for both the high and low temperatures. They measure in at 61°F (16°C) and 46°F (8°C) respectively. Precipitation levels hover at 33 mm. In April, the average high temperature creeps up to 64°F (18°C). The average low temperature also sees an increase to 50°F (10°C). Barcelona Weather in May: There’s a moderate amount of spring showers in May with the precipitation rate at 54 mm. The high temperatures average 72°F (22°C). Meanwhile, the average low temperature also increases significantly to 57°F (14°C). June is the driest month of the year with only 11 mm of rainfall to be expected. It’s also the sunniest month of the year with 10 hours of sunlight per day. Temperatures increase to 79°F (26°C) for the high temperature average and 64°F (18°C) for the low temperature average. In July, the climate continues to get warmer as summer goes on. The average high temperatures and average low temperatures are 82°F (28°C) and 70°F (21°C) respectively. The summer season brings with it the peak tourist seasons. 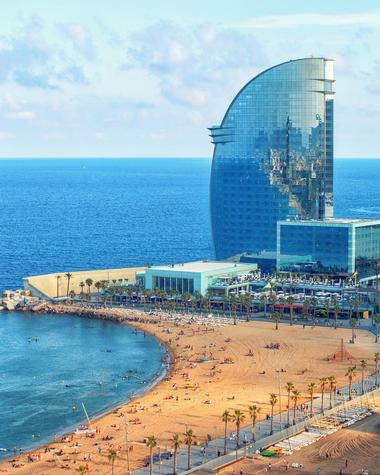 Barcelona Weather in August: It’s the best time of the year to hit Barcelona’s beaches in August as sea temperatures are at a pleasant 26°C. August is also the warmest month of the year with the high temperature average at 84°F (29°C). Low temperature averages remain the same at 70°F (21°C). September sees temperature averages decreasing in general. The average high temperature decreases to 79°F (26°C) while the average low temperature goes down to 64°F (18°C). In October, Barcelona receives the most rainfall of the year with precipitation averages at 87 mm. The average low and average high temperature measure in at 57°F (14°C) and 73°F (23°C) respectively. Barcelona Weather in November: The climate cools off quickly in November as the high temperature averages decrease by over 10 degrees to 64°F (18°C). The same can be said for the low temperature averages, which drops down to 48°F (9°C). December receives the least sunshine of the year with 4-hour daily average. This coincides with a further drop in both the average low and average high temperatures which range between 41°F (5°C) and 57°F (14°C). Ready to experience the best of Barcelona’s festivals? Plan your trip to this beautiful Spanish city in between the months of May and June when several festivals take place. To avoid the tourist rush of summer a trip between May to June is also the best time to visit. For more affordable hotel rates, plan your trip during the lean season from September through December. The best travel deals, however, are to be had in between January and April when the temperature gets a bit chillier but the sights remain gorgeous. Many people arrive in Barcelona by airplane. El Prat in Barcelona’s international airport: it is located about seven miles southwest of the city center. It is served by many international airlines. There are two major train stations in Barcelona. High speed trains from Madrid and from Paris arrive at the Estacio Central de Barcelona-Sants. Slower trains from northern Spain and southern France arrive at the Estacio de Franca. By car you can take E-15 from France at the eastern end of the Pyrenees or via Toulouse using N-152. Buses are another option; however they are much slower than the trains and less comfortable. To get from Barcelona’s El Prat Airport into the city, you have several choices. 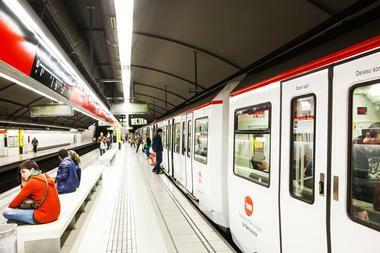 The train from the airport to the city runs every 30 minutes and makes stops at three main train stations: here you can transfer to the Metro system. There are several bus companies that travel between the airport and Barcelona. The airport Express bus is called Aerobus and is more expensive than the normal Barcelona TMB bus. There are private minibus shuttle companies that are shared bus shuttles. Taxis are available to make the 20 to 25 minute trip from the airport into Barcelona, but fares can be high especially for single travelers. 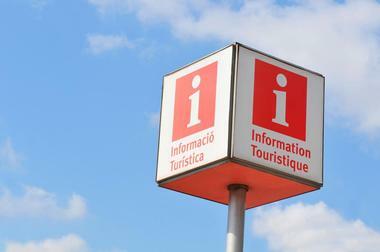 The official visitor information center is called the Officina de Informacio de Turisme de Barcelona. 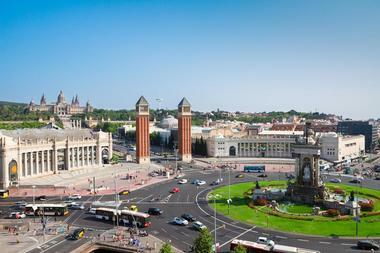 It has many locations all over the city, but its main location is at the Placa de Catalunya in the heart of the city. It also has locations at both terminals of the airport: this is convenient since travelers can gather information even before they reach the city. At all of these visitor information centers professionally trained staff will greet you and help to answer your questions like how to get around the city, where to shop, where to eat, where to sleep, and what to see and do. 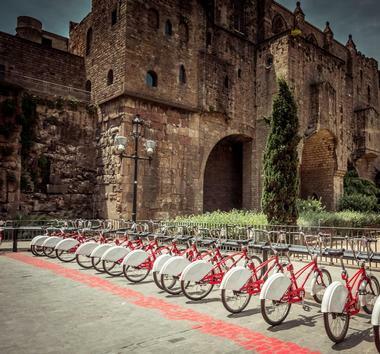 There are several good ways to get around Barcelona. The city operates an extensive bus system with over 1,000 buses serving all areas of Barcelona with more than 80 routes. These routes connect the city’s neighborhoods and the metropolitan area. Transportation passes can be used on the metro, the tram, and several train lines. This means you can get around the city using one pass on several modes of transportation without paying extra. There are single tickets and day passes called Hola Barcelona. Buses arrive at bus stops about every 20 to 30 minutes and service runs from early in the morning until late at night. Nitbuses run during the night. Ferrocarrils de la Generalitat or FGC is an integrated transportation system that includes the metro, tram, and the urban and metropolitan rail network, You can use tickets and passes to change from one mode of transportation to the next within the system. The metro system is made up of eight lines that are identified by numbers and colors. There are three urban lines that complement the metro system. Single fares are available as are day passes called Hola Barcelona. The tram system has been revived after it died in 1971. Today it is a fast, convenient, and comfortable way to get around the city. There are two tram lines in Barcelona. Barcelona has an excellent integrated public transportation system, but there are several other ways to get around the city. 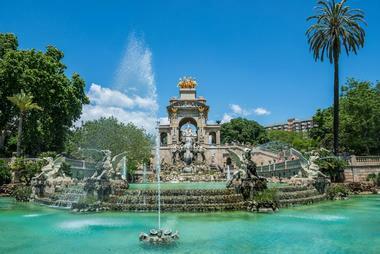 If you are visiting Barcelona’s old city, you can explore on foot. You can also do this in other interesting districts, but in most cases you’ll need to use another form of transportation to travel from one district to another. 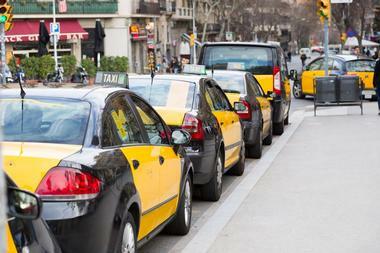 If you need to use a taxi, there are plenty of them in Barcelona: more than 11,000! A green light on top of the taxi means that it is available. Driving in Barcelona is extremely challenging because traffic is congested and parking places are limited. Barcelona has many bike lanes as well as parks and paths. Barcelona is a food lover’s dream: eating is a favorite past time in this city that is full of excellent restaurants and other eateries. There are world renowned professional chefs who make new creations every day for hungry diners. These chefs use fresh regional produce found in markets and superb wines to complement their special dishes. Many chefs experiment by using traditional dishes and by adding unusual ingredients to bring the dishes up to date. There are more affordable and modest dining spots in old-style taverns, in bars where Spanish tapas are served, or at an outdoor bistro where you can enjoy paella. Shopping is a serious business in Barcelona: people seem to be carrying shopping bags everywhere you look! The Barcelona Shopping Line is the premier shopping area that features all of the leading brands from around the world. There are also shops that sell affordable clothes and accessories to young people; boutiques offering the latest trends; and museums that sell unique items that make great souvenirs or gifts. Two good museums to try are Museu Picasso and the Fundacio Joan Miro. Here you’ll find books, jewelry, scarves, and more. There are many boutiques along Passeig de Gracia: this is Barcelona’s most famous and upscale shopping street. As a big city, Barcelona can be divided into several neighborhoods, each with its own unique ambience. Barri Gotic, or Gothic Quarter, is where many people begin their visit. It is one of the oldest parts of Barcelona and is home to La Seu Cathedral and the Placa Sant Jaume. 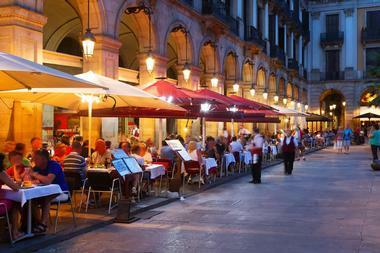 Las Rambla is a pedestrian street: it is so well traveled that it is considered a neighborhood: Las Ramblas. This tree-lined street is one of the most popular places in Barcelona. 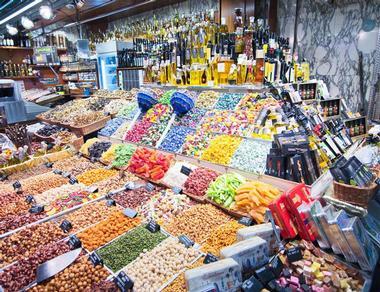 El Raval is known for its Boqueria Market and its ethnic diversity. Eixample is a neighborhood that is most famous for Antoni Gaudi’s La Sagrada Familia church. 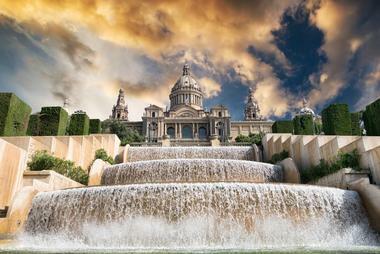 With its many wedding venues, Barcelona is a popular place to get married. Both Spanish and non-Spanish people can get married in Spain. A certificate of permission to marry can be obtained at the Civil Registry in Barcelona. Hotel wedding venues include the Majestic Hotel, the Hotel Miramar Barcelona, the W Hotel, and many more. 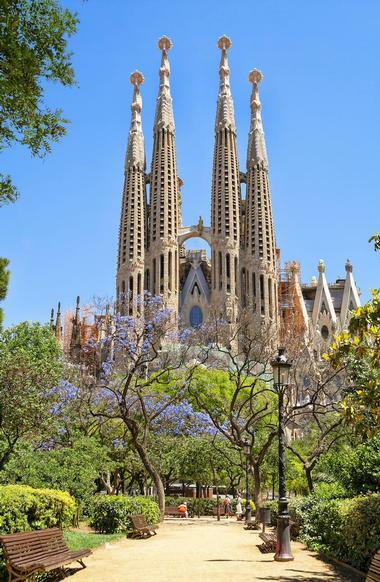 Church weddings are popular in Barcelona: some choices include Santa Maria del Mar, the Barcelona Cathedral, and Sant Pau del Camp, the oldest church in the city. A villa is a good options for a wedding venue: some of these are La Baronia, Masia Ribas, Almiral de la Font, Casa Felix, Sol I Vida Garden Terrace, and more. As a popular tourist destination, Barcelona has many options for accommodations. 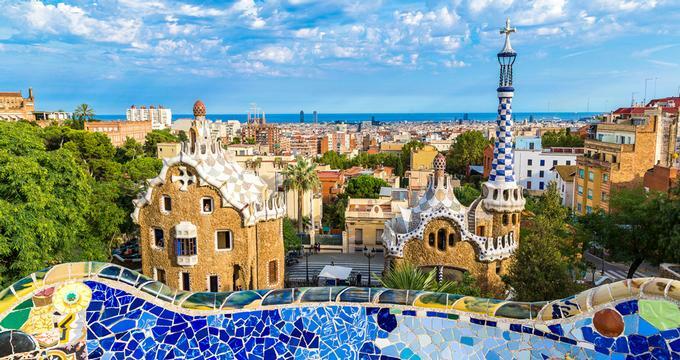 In addition to being a popular tourist destination, Barcelona is the favorite city where Europeans can take a break. There are luxury hotels, affordable old hotels, and hotels close to Barcelona’s Mediterranean shoreline. Luxury hotel properties include Hotel Neri, Relias and Chateaux; the Mandarin Oriental Barcelona, Alma Barcelona, Bagues Hotel Barcelona, and more. The Barri Gotic is a good neighborhood for guesthouses and small hotels. North of this neighborhood is the Eixample district: here room prices are a bit higher. For families who enjoy open-air spaces, accommodations in the Sants and Placa Espanya areas are good choices.